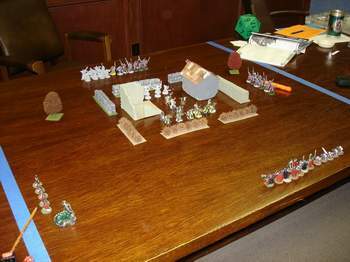 On april 24th (2007) the 4-State Militia played a scenario designed by Canonball. As the Title says it was called "A Diplomatic Solution". In a deserted and burnt-out village on the edge of Firstborn and Mother tribe territory, 2 representatives meet to discuss an alliance to push back the hated devout from FB territory and then to clense the Ice Caves from the taint of the Elves!! As the 2 diplomats began their meeting, the blast of a FB Warhorn filled the air with the warning of danger. As the chronomancer looked to see his men forming a shield wall facing to the south, he could see the forces of the Devout move towards the wall. the Hunter of the Mother Tribe gazed to the north and saw the Crystal Lotus elves rush the breaches in the wall as a Lotus-eater began to chant. "WE ARE BETRAYED" cried the Hunter as his Berserkers began to froth with the exitement of the battle to come. 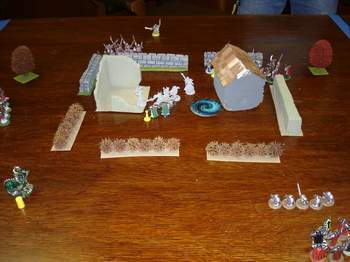 The FB and SOK occupy a ruined village in the middle of the board. The Devout can deploy anywhere along the south and west sides of the table. The CL elves deploy along the north and east sides of the board. 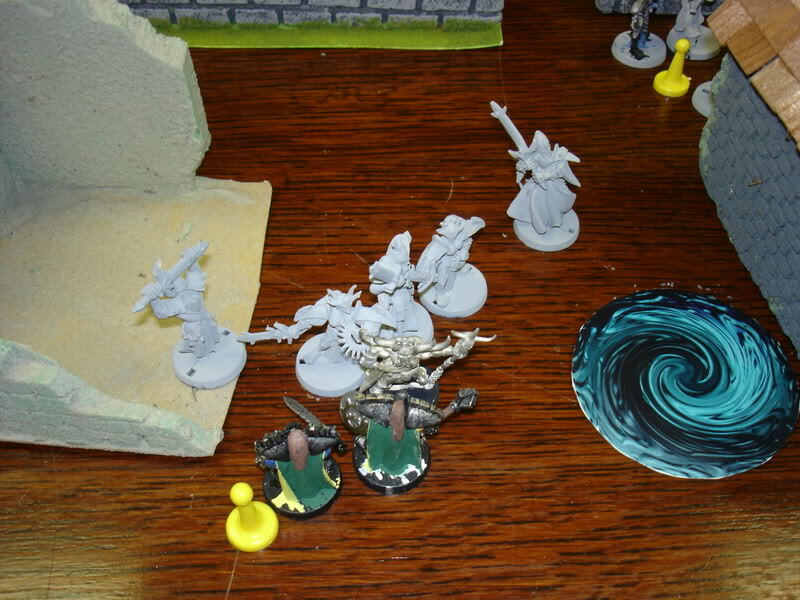 The object of the game was for the Devout and the CL elves to kill the Chronomancer and the Hunter. A D12 would be rolled at beginning to determine the number of inches in the antagonists would deploy. 3 V.P. are awarded for either getting/killing the Chronomancer(Devout) and the Hunter(CL). The FB recieved 3 V.P. (per model) for getting the 2 models off the board. Devout/CL also recieved 2 V.P. for killing the other diplomat. 2 V.P. would be awarded for the most kills and 1pt for the 2nd most. Both the CL and the Devout knew this one would be won or lost fairly quickly. If the "Diplomats" broke out into the open it would be hard to stop them form escaping off the board. As it would turn out, both the CL and the DEVOUT decided to make use of, and rely on, magic to win or lose. The game started with the rolling of D12 to determine placement. The CL rolled an 8, so they could deploy up to 8" from the edge of table. The DEVOUT rolled his dice.............A FRIGGIN 1!!!!!!! Mustering up as much dignity as possible, DogOWar put his boys on the board. God I HATE my dice!! Initiative went to the CL, Dog mentioning how Troy must have made a pack with the Devil to have such luck. The highlights of this turn was TROY (CL) casting Sky Chariot on his Dream Warriors and moving them right next to Chronomancer, promptly killing him. 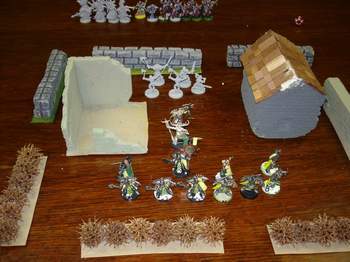 FB Swordsman and Berserkers engage Elves. DogOWar (DEVOUT), not wanting to be outdone by no stinking panzy elves unleashes the deadly VORTEX into the FB. A roving patrol of Blade maidens appears behind 2H followers and a melee insues. CL slays Hunter and most of Berserkers. Damned charges Blade Maidens, slaying 2. CL finishes off FB swordsman while DEVOUT are trying to work around sides to engage Elves/FB to atleast get most pts killed. The VORTEX moved away from the fray and slammed into house............D@MN DICE(beginning of turn)!!! A few more killings and the CL move to retreat off board. GAME OVER!!! This was over in a hurry. Troy's great use of the Sky Chariot/Dream Warriors spelled doom for both the FB and Devout. Not even the vortex could help the Devout win the day. Shocked Sad Embarrassed Starting so far back form the rest really hurt the Devout, as about the time I was moving into position the game was already over! FB/SOK were caught with their pants down, with to much of a gap between their forces. This was a fun scenario, and I'm sure Canonball will remember The Sky Chariot for a long time to come. We ended up playing a pickup game with 500 pts apiece after this. It was a "King Of The Mountain" variant, with the object being to capture a Sacred Swine from atop a Ziggurat. This was great fun as much carmage was had and the DEVOUT WON!!!! First version from 20.11.2011. Last Version from 20.11.2011.